The second entry in the found footage horror anthology (and less than a year after the first to boot) is not as clever as V/H/S but more polished, better paced, and full of enough ingenuity to recommend, especially for horror fans. In my review of the first film I championed a shorter format, giving an audience the thrills they crave faster rather than slogging through an hour of slow buildup. The results are still fairly hit or miss, though none of the four segments is a misfire per se. The weakest is probably the last, “”Slumber Party Alien Abduction,” where the poor camera quality makes it hard to tell what is actually going on. The best, by far, is The Raid director Gareth Evans’ “Safe Haven” about a team of journalists picking perhaps the worst day to tour a creepy cult’s compound, notably during the apocalypse the cult predicted. This one takes a bit to wind up but when all hell breaks loose it goes nuts with glory. The wraparound segment tying everything together is more palatable and points to a promising mythology around the collection of these haunted VHS tapes that people keep watching and then dying over. All together, this is a concept that just works for horror and I’ll welcome presumed sequels as they come off the assembly line. This is found footage done right, with faster payoffs, more variety, and greater focus and ingenuity. 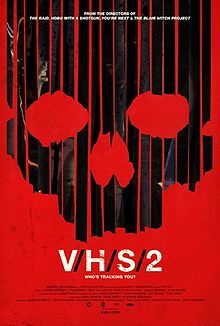 If you enjoyed the first film, or are a fan of horror anthologies in general, then pop in V/H/S/2. Posted on July 18, 2013, in 2013 Movies and tagged aliens, anthology, demons, drama, found footage, ghosts, horror, indie, sequel, thriller, zombies. Bookmark the permalink. Leave a comment.